Photos in this gallery capture scenes from New York, ranging from sunsets over the Hudson River, Grant’s Tomb, and the hustle and bustle of Times Square on a Friday night. 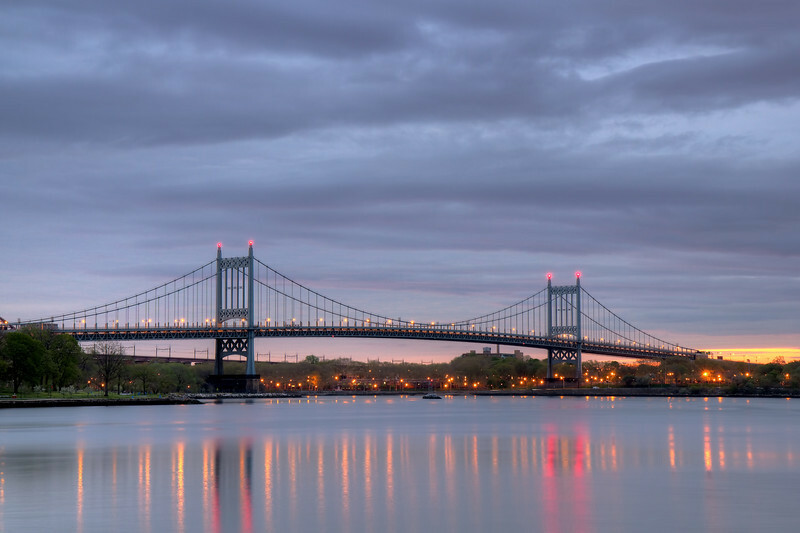 Here is the RFK (formerly known as the Triborough Bridge in the early morning. Plans for connecting Manhattan, Queens, and the Bronx were announced in 1916. Final funding was approved in 1925 with construction starting on Black Friday in 1929. Construction stalled due to lack of money. With New Deal money the project received new life in the early 1930s by Robert Moses and the bridge opened ion July 11, 1936. The total cost of the bridge was $60 million, one of the largest public works projects during the Great Depression. The American Society of Civil Engineers designated the project as a National Historic Civil Engineering Landmark in 1986. In 2008 the bridge was renamed after Robert F. Kennedy pursuant to a request from the Kennedy family. The bridge crosses the East River at the Hell Gate between Queens and Wards Island. The length of the main span is 1,380 feet and the length anchorage to anchorage is 2,780 feet. The height of the towers above the water is 315 feet. For more detail see Wikipedia. This is an HDR from three exposures at f9, 100 ISO, from 1-15 seconds.